Get free advice and estimates from water heating professionals in your city. Regardless of the style of home you have or the type of fuel you use with it, one thing remains the same. You need a way to heat your water for cooking, cleaning, and bathing. Water heaters come in many sizes and styles, but the two most popular methods are a standard, tank-style heater and a tankless heater, also called an on-demand heater. Both provide hot water for your needs, but they work differently. Depending on your home and needs, one may be a better fit. We outline the differences below so that you can make a more informed decision about which is right for your home. You are probably familiar with the standard tank heater. This is a large cylinder that sits in your utility area, and it heats and maintains your water at a constant, preset temperature. These heaters come in sizes starting at 25 gallons and may be fueled by gas, oil, propane 1, or electricity. They work by heating the cold water that enters your home to the desired temperature and storing it until needed. They work 24/7, so you always have hot water waiting. Tankless heaters are installed inside your walls, where you cannot see them. They are much smaller because they do not hold water. Instead, the pipes that supply your water pass through the heater, and it heats the water passing through the tank instantly. 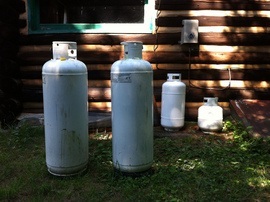 They typically run on gas or propane 1, but some models use electricity. When you are not running water through them, they are essentially in standby mode, not using any fuel or heating water. Because a tank-style heater runs constantly, it continuously uses energy. If you go out of town for a day or two and use no hot water, your tank still heats the water and uses energy. Many tank-style heaters are also set to heat the water to temperatures that are in excess to what most people need, using even more energy. While they can be lowered manually, a water heater uses a constant supply of energy. Tankless heaters only turn on when water passes through them, so they use less energy overall. They do not use a constant supply of energy, but they use more energy minute for minute when they are operating. The tipping point for energy-efficiency comes when you use large amounts of water every day. For a household that uses 41 gallons or less of hot water daily, you will use 24% to 34% less energy with a tankless heater. This savings decreases as you increase the number of gallons used per day. If you fill a large soaking tub each night with hot water and use more water for washing machines, dishwashers, and showers throughout the day, a tank-style heater comes out ahead. But for homes that use less water, tankless styles save more energy. Of the two models, tank-style storage heaters are easier to install. It takes only minutes to position the heater in place and connect the water and fuel supply. Because the tank is usually in a basement, utility closet, or other easily reached area, installation is not considered invasive or difficult. Tankless heaters, however, have a more complex installation. Installed inside your walls, the pipes must be spliced and connected on either side. So, the pipe must be located, wall opened, pipes cut and disconnected, then the heater installed, pipes reconnected, and the walls closed and repaired. 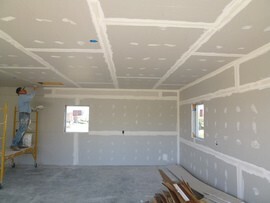 This process takes considerably longer and, depending on the location, may require finishing work. Tank-style water heaters are priced mainly by their size. For a home with three or four people, you need a 50-gallon tank, which costs around $500 for a gas-fueled model. Installation costs around $45 to $65 an hour, which adds $90 to $200 to the total cost. This makes the final price between $590 and $700 for the average water heater. Tankless heaters typically cost more to install but have similar purchase costs. A single-point unit, fueled by gas, costs around $500 and has similar costs for the plumbing installation of $90 to $200. Added to that, however, are the other installation costs, such as the new plumbing which runs between $250 and $500, the drywall 2 after the wall has been opened for $200, and an access door to reach the heater for repairs for an additional $100. This makes the costs of a tankless heater between $1,140 and $1,500. A standard, tank-style heater lasts on average between 10 and 12 years. The reason why it does not last longer is usually due to sediment and poor water. Over time, corrosion from the constant water and mineral buildup wear away valves and the bottom of the tank. Regular draining and cleaning of the sediment at the bottom of the tank can prolong their lifespan. 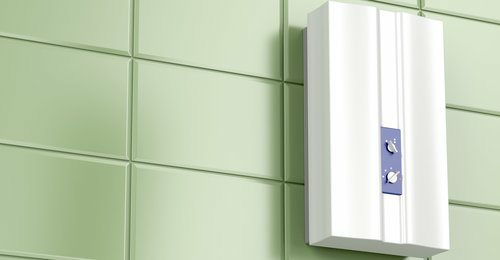 Tankless heaters can last up to 20 or 30 years with proper maintenance. Because they are not constantly subjected to standing water, they do not corrode or experience the same type of mineral buildup. They can, however, develop mineral problems in areas with hard water 3, which makes proper maintenance important to their longevity. One of the biggest problems with a standard storage-style tank is that it heats and maintains the water inside, and once you use that water, you must wait for it to refill and reheat the new water before you have more hot water available. So, if you have a 50-gallon heater and your family takes several back-to-back showers, you need to wait for it to refill and heat up before running a sink full of hot water. The only way to solve this issue is to purchase a tank that is larger than what you typically use in a day. Tankless heaters do not run out of hot water because they heat the water as it enters the system. So, as long as you have fresh water entering the heater, then you have a constant supply of hot water as well. Storage-style tank heaters have very little maintenance. It is recommended that every few years, you empty the heater to remove some sediment, and then refill. Otherwise, they do not require any regular care. Tankless heaters require regular, yearly maintenance to make sure they work properly. Many internal parts need to be kept in good repair to ensure that the heaters run the way they should. Most suppliers have a maintenance plan that they recommend for the specific models they sell. Tank-style water heaters are simple to repair and replace. They are easy-to-reach and have few parts that may need replacing. This makes repairs fairly inexpensive if something goes wrong. Tankless heaters, however, are more complex, which makes repairs or replacement more challenging. While a maintenance opening is usually left nearby, repairs may need more access, which can mean opening walls and the required finish work later. This can make a repair more serious, time-consuming, and expensive. Tank-style heaters have a footprint 4 of anywhere from 16 to 36 inches in diameter. This means that you need to have at least this much space somewhere in your home to place it. Tankless heaters are installed inside your walls, so they do not take up valuable space within the home itself. They can be installed on any “water wall” with 6-inch thickness or more, including outside walls to help save space. One advantage of a storage tank-style heater is the fact that you get consistently hot water until the water in the tank runs out. This is usually sufficient for a shower, bath, or using the washing machine. It is also possible to use one tank to operate multiple water appliances simultaneously or on different floors or areas of the home. Tankless heaters, however, are generally installed at a single point on the line. In most cases, that is close to the room where it will be used in. So, near a bathroom or kitchen, for example. For homes with multiple bathrooms, you may need multiple tankless heaters so that each water source has a dedicated heater. Tankless heaters also may not turn on if the water faucet is open only slightly. So, attempting to run water through the pipes in the winter so that they will not freeze may not be an option unless you want to run the water full blast. 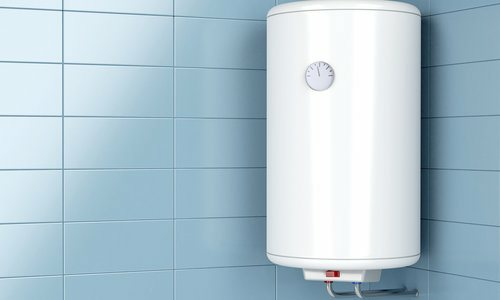 Finally, some models of tankless heaters may give you what is known as a “cold water sandwich.” This means that occasionally the amount of water coming through the heater is too much for it to handle, so in the middle of your hot shower, you get a blast of cold water before it reverts back to hot. Most newer models are designed to avoid this problem, but it can still occur. If you have a tankless water heater in your home, you may find that it works better if you invest in a water-softening system as well. This helps negate some of the minerals in the water so that they will not impact the use of the heater. Tank-style heaters do not need a water softener 5 to work, but adding one can be done. 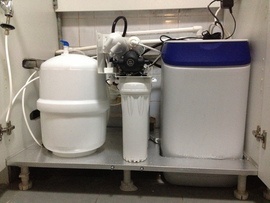 Cost Considerations: Water softeners range from $500 to $1,500, depending on the quality and the capacity.